The GoPro is a great camera to shoot action footage of surfing, skiing, and mountain biking. However, there are lots of other ways to use this versatile, little camera. If you are a student or scientist studying the marine environment, you will find this camera useful in capturing underwater footage in tide pools or tidal creeks. I just finished a new tutorial to show how to set up the GoPro to film underwater in a tide pool or other shallow water setting. 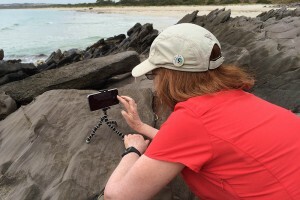 I also cover three ways to approach filming in a tide pool as well as some safety suggestions to avoid damaging your camera. 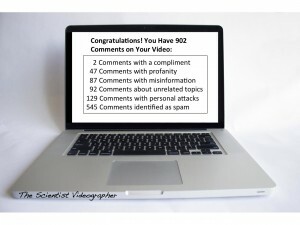 Should You Allow Viewer Comments on Your Science Video? In the previous post, I began exploring the topic of how online commenters can influence reader/viewer opinions about a science article or video. I pointed out two studies, which showed that negative comments can sway how readers perceive a science news article or how viewers perceive a public service announcement. In this post, I’d like to talk a bit more about what you can do as a creator of online content to minimize potential distortion of your science message—focusing specifically on videos. 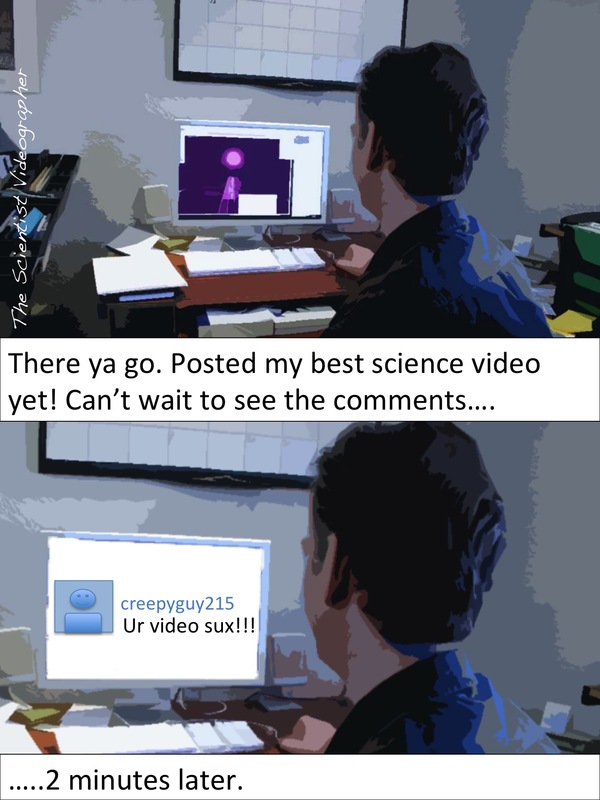 Given the potentially negative impact of fractious commenters, what should the scientist videographer do? Allow all comments on posted videos, regardless of civility or agreement with your video content? Block all comments? Compromise by filtering out personal attacks, off-topic discussion, and profanity-ridden diatribes? Something else? As I mentioned in the previous post, some science outlets have chosen to completely block all commenting on their videos. The U.S. Geological Survey, for example, blocks commenting on its YouTube channel but allows voting. This decision means that people who’ve watched the science videos that I published through USGS have no way of asking questions or providing me with feedback (e.g., about whether the video was clear or confusing). I do get some information from the statistics—number of views, likes/dislikes, embeds, and shares—that tells me something about how my video is being used. However, without specific comments, I don’t know what someone liked about my video or if someone else disliked the way I presented some aspect of the topic. That is important information for me to improve my videos and make them more understandable by my target audience. Other science agencies, such as NASA, do allow commenting on their videos. And they don’t seem to police the comments, as there are off-topic or abstruse comments on some videos. Not surprising, though, considering their channel has over 500,000 subscribers and over 3,000 videos. Most of us don’t have the level of interaction with our videos that NASA has. Our situation is often quite different from that of a science agency. So what should the individual video maker do? The decision depends on several factors, specific to each situation. There is no right way or best way to go. But I can tell you what I do and why. On both my YouTube channel and this blog, I allow only approved comments. I’ve set the preferences so that I’m able to review each comment and then decide whether to allow it or delete it. Any comments that contain profanity, personal attacks, off-topic statements, misinformation, or spam are immediately deleted. If anyone repeatedly makes insulting comments on my channel, I have the option of banning them (which blocks them from ever posting a comment to my channel again). I can also report spam or abuse to YouTube as well as set up a “blacklist” with keywords to identify unwelcome comments. Note also that all commenters must have an account to comment on a video, which means no one can make anonymous comments—anyone can hover their cursor on the commenter’s name or pseudonym and find their account and any content they’ve posted. See this page for help setting comment moderation preferences on YouTube. By the way, I do not respond to the insulting commenters. Many are trolls who are trying to get a rise out of the content creator or to cause general mayhem on a site. Others are people (I suspect teenaged boys) with the manners of a warthog. You might be tempted to lash out and write a scathing putdown, but that just feeds the fire and invites more insults. Instead, by simply deleting their comment without reacting to it, you consign them to an electronic purgatory where they are uncertain about whether their offensive missive even hit its target. And they are essentially helpless to do anything about it. On this blog, my main problem is spam. For this, I use a plug-in (Akismet) to trap spam—and there’s a lot of it; over the past six months, there have been 210,000 comments identified as spam posted to this site. Still, a few slip through, but I can easily delete the three or four that the spam filter misses. Sometimes, there are borderline comments that are difficult to categorize. Some of the spammers are getting better at hiding their true nature in an almost human-like comment, and a few of these slip through. But over time, I’ve gotten much better at spotting spam comments. If I’m suspicious, though, I’ll usually delete the comment, figuring that if it is legitimate and important, the commenter will try again. That’s rarely happened, however. So that’s how I take care of the trolls and spammers. What about people who are just critical of my videos? Most of the comments I’ve received on The Scientist Videographer blog and on my YouTube channel are positive. However, a few commenters have pointed out errors or provided constructive criticism that I’m happy to correct or otherwise address. I’m grateful to all who have taken the time to write thoughtful, constructive comments. So, I allow all comments that point out an error in a video, simply disagree with something, offer an alternative opinion, or complain about not understanding something. I also try to reply to such comments—I view these as another opportunity to inform users about some aspect of the topic or to explain a particular point in greater detail. Even if the tone of the comment borders on aggressive/aggrieved/sarcastic, my reply is polite and respectful—and I try to resolve whatever the problem is or point the commenter to another site where they can find the information they need. My goal is to turn a complaint into a lesson or opportunity for additional learning by all viewers. In summary, I consider the time it takes to filter comments to be time well spent—for the following reasons. 1. As I said above, I welcome critical comments as opportunities to provide more information to viewers or readers. I often get questions about why I chose one video approach over another, for example. My reply then provides details that could not be easily included in the video, and this addition enriches my original posting. 2. Critical comments help me improve my videos. The nice comments that thank me for a video tutorial are great, but they don’t help me improve. It’s the critical comments that show me where I could have done better. If you are a scientist who’s published papers, you already know this. 3. I put a lot of time and effort into creating content for my blog and video channel and also spend time optimizing that content for search engines. The comment section is an important component of each online posting, and as such deserves some attention. If comments influence how future viewers/readers perceive the quality of my videos or blog posts, then it’s essential that I ensure the comment section is not bogged down with spam or off-topic conversations. Do Online Comments Sway Opinions About Science? 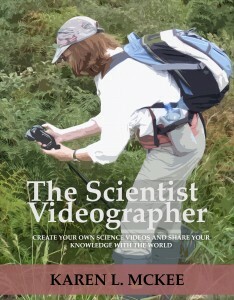 During the question and answer period after a recent seminar I gave on “Communication Tools and Strategies for the 21st Century Scientist”, someone asked me about whether I thought there was a downside to scientists communicating their work through video, social media and other online activities. I was not sure at first what specific downside the questioner was talking about. There are obviously a number of pitfalls that scientists may encounter when engaging directly with the public. Previous posts have addressed some of these (here and here, for example). One issue that I’d like to explore in this post is the phenomenon of online commenters who distort the viewpoint of readers/viewers about a science topic. 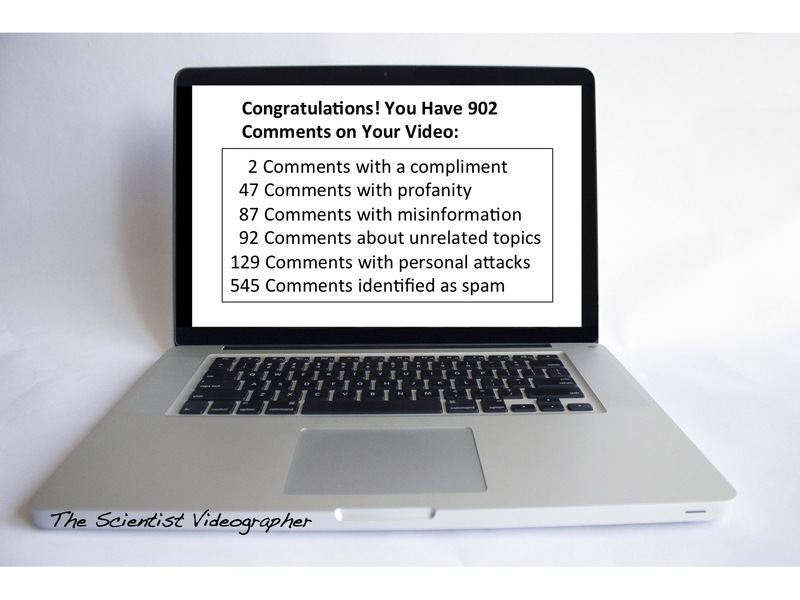 This “commenter effect” is of concern to the scientist videographer who regularly posts science videos online. One decision that must be made during posting is whether to allow user engagement (i.e., allowing viewers to vote (likes/dislikes) and/or comment on the video). We’ve all seen online science articles and videos that are followed by a comments section filled with rants, digressions, personal attacks, and inaccurate statements by people with absolutely no expertise in science, not to mention the specific subject under discussion. These negative comments often hijack the discussion and obscure any legitimate exchange of information and opinions. More recently, however, studies (see below) have suggested a more troubling effect, which is that commenters can sway the opinions of others about a science topic—even when the source of the original information is highly credible. In other words, people’s confidence about the science being presented by legitimate sources could be shaken by commenter opinions. That’s pretty scary when someone with no scientific credentials (and possibly ulterior motives) can be more persuasive than a science professional with years of experience. This cartoon captures this conundrum perfectly. Another study (see the preprint here)—perhaps of more relevance to the scientist videographer—examined how perceptions of a Public Service Announcement (PSA) were influenced by user comments. Groups of study participants were shown two fictitious PSAs, one advocating vaccinations (the CDC) and another warning against vaccinations (an anti-vaccination group). The results indicated that, in addition to the PSA message itself, the consumer’s opinion of the PSA was influenced by commenter’s reactions to the PSA. In another experiment, the commenters were identified as being a doctor, a lobbyist, or a student. This information about the identity of commenters had an effect on the consumer’s opinion and appeared to moderate the influence of commenters, e.g., when the expertise of a commenter was high (doctor), their comments had a greater influence on consumers than did other commenters (lobbyist, student), regardless of the PSA-advocated position. The take-away from these two studies might be that allowing commenting by everyone, regardless of expertise or intent, is counter-productive to science communication. That seems to be the thinking behind some decisions to block all commenting on science articles and videos. However, I think this reaction needs more scrutiny. Science benefits from an open exchange of ideas and opinions. Completely blocking input from the public cuts off a potential source of information and questions that could stimulate further research. It also sends the wrong message (that science communication is a one-way street) and dampens potential public interest in a science topic. I think there is a compromise that will allow commenting but may minimize the negative influence described above. I’ll explore this option in the next post. In the end, my response to the seminar question was that if scientists don’t participate in the conversation, other voices will gladly fill the gap—voices that don’t necessarily represent the best interests of science or scientists. I think that is a far more dangerous situation than the one in which scientists engage the public and make their work accessible and understandable by the broader audience. In addition to the keynote address, I also visited Ben McNeil at the University of New South Wales in Sydney and gave a seminar entitled, “How Video Can Enhance the Communication of Science”. Ben is a co-founder of Thinkable, an online platform that facilitates crowdfunding of research and requires proposers to pitch their projects in a 3-minute video. We had interacted previously by email and Skype; so this trip was a chance to meet in person and share ideas about scientists using video. 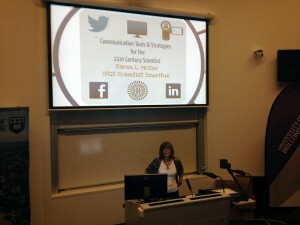 I also made some great contacts with science communicators at the seminar. Read more about Thinkable in this earlier post. 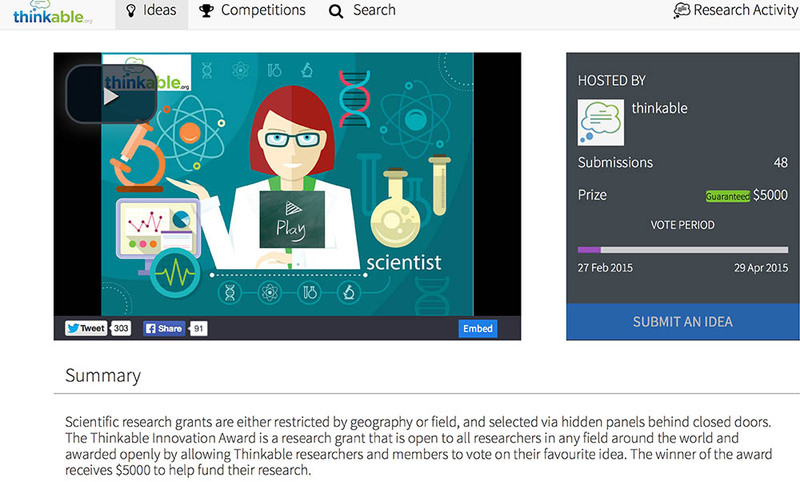 Also, Thinkable is currently running a competition with a $5,000 award; the submission deadline has passed, but voting is ongoing until April 30, 2015. I mention this competition because you can see how some researchers are structuring video proposals and perhaps get some ideas for your next video (and don’t forget to vote!). I also had the opportunity before the conference to do some traveling around South Australia and try out my iPhone 6 to shoot video. 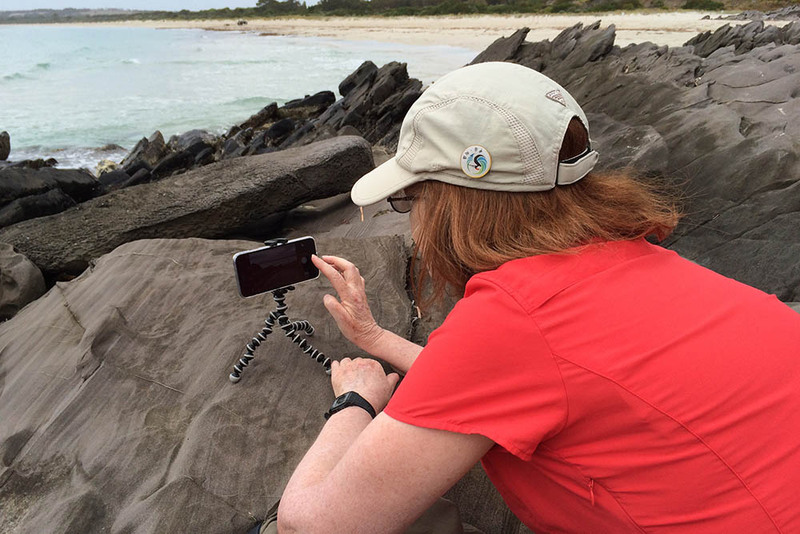 In the photo, I’m setting up the phone to shoot a time lapse of the surf on Kangaroo Island. I’ll be sharing my experiences and some of those videos in later posts. As you may have noticed, I’ve not written any posts recently. Between traveling and a computer crash (aaaarrgggghhhh), I’ve not been able to write much of substance. I was really hamstrung without access to my photo and movie files. Fortunately, I had everything backed up….unfortunately, the backup was at home 9,000 miles away. However, I’m now all set up with a new laptop and ready to catch up with my writing. More about this trip later….